Mindstorms Mayhem members Melissa Gray and Katie Hammes before the start of the final round. The team of homeschoolers won the state title for the third year in a row. MILFORD - Last spring, they were only second in the world. 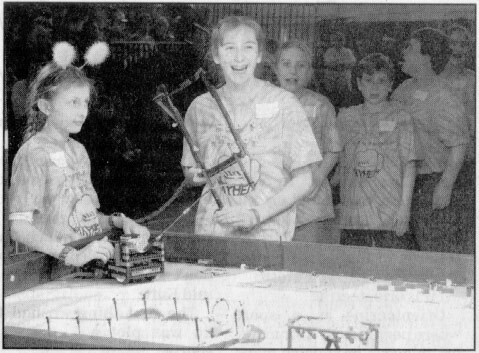 Believe it or not, that was something of a step down for the Mindstorms Mayhem FIRST LEGO team that had finished first in the world in 2004. In April, this team of homeschooled students from several southern New Hampshire communities have a shot at reclaiming their world championship, thanks to taking the state title (known as the Director's Award) last weekend at the BAE Systems FIRST LEGO League tournament at Nashua High School. The team is eligible to go to Atlanta for the world tournament. The team's state LEGO project dealt with producing electricity from the oceans in a challenge called "Ocean Odyssey." Mindstorms Mayhem, and its companion team of younger students -- More Mayhem (which finished first in Robot Performance) -- had to research an ocean activity or resource and trace its impact on the health, biodiversity, and productivity of the oceans. Using robots, they had to complete a series of simulated underwater tasks. Charlotte Gray, who handles publicity for the home-school teams, attributed their continued success to "excellent coaches who really work with the kids as far as practices, getting them to understand the programs, and really inspire the kids to a high level of performance. The kids rise to their level." Mindstorms Mayhem is coached by Ken Streeter of Bedford and Bill Gray of Milford. More Mayhem is coached by Streeter and Gray with assistance from Mark Ericson of Amherst and Jon Coffman of Hampstead. Student mentors that helped this year are Lauren Gray, Milford; Nathan Gray, Milford; Ben Streeter, Bedford; Christopher Jennings, Merrimack; Brittany Jennings, Merrimack.